We’d love your help. Let us know what’s wrong with this preview of The Keep by F. Paul Wilson. "Something is murdering my men." Thus reads the message received from a Nazi commander stationed in a small castle high in the remote Transylvanian Alps. And when an elite SS extermination squad is dispatched to solve the problem, the men find a something that's both powerful and terrifying. Invisible and silent, the enemy selects one victim per night, leaving the bloodless "Something is murdering my men." Thus reads the message received from a Nazi commander stationed in a small castle high in the remote Transylvanian Alps. And when an elite SS extermination squad is dispatched to solve the problem, the men find a something that's both powerful and terrifying. Invisible and silent, the enemy selects one victim per night, leaving the bloodless and mutilated corpses behind to terrify its future victims. Panicked, the Nazis bring in a local expert on folklore―who just happens to be Jewish―to shed some light on the mysterious happenings. And unbeknownst to anyone, there is another visitor on his way―a man who awoke from a nightmare and immediately set out to meet his destiny. To ask other readers questions about The Keep, please sign up. Loyalty to Germany is not enough. Hitler demands loyalty to himself before country, family, or God. So even though Woermann is a decorated hero from the First World War, winning an Iron Cross for bravery, with the new Nazi regime this counts for very little. After all, they lost that war. It is unthinkable that they could lose a second. When Woermann’s men, one by one, start showing up dead with expressions of pure terror etched on their faces and their throats ripped out, it doesn’t take long for Woermann to realize that this is no act by man. This terror is being perpetrated by something, not someone. And why are there 16,807 crosses inbedded in the rock of the Keep they are occupying? And why is this Keep even here? What purpose did it serve when it was built? When a fortified structure is too small to be considered a castle, it is called a keep. Woermann is hoping to get the order to move his men to a new location. Instead he gets SS-Sturmbanfuhrer Erich Kaempffer. It is a nightmare anytime the SS show up, but for Woermann it is made many times worse by the presence of Kaempffer. He knows something about Kaempffer that Kaempffer doesn’t want anyone to know about. As a result, they loathe one another. It turns out SS stormtroopers die just as easily at the hands of this creature as regular German army soldiers. They turn for help to a Professor Theodor Cruz and his daughter, Magda. Cruz is nearly incapacitated by illness, but he is still their best hope to figure out what exactly is going on in the Keep. The irony is he is a Jew, the very people that Kaempffer has made a career of exterminating. Why are there no birds in the Keep? Magda is a beautiful, sexually repressed, young woman who collects folk songs sung by gypsies and other native people. She is a delectable morsel among beasts of prey who have raped their way across Europe. Oddly enough, her only saving grace may be the fact that this something, this fiend, may want her for himself. Her blood is like honeyed ambrosia. The eyes are so seductive that, despite her fears, she wants to let this creature have her. She feels the pull to be whatever this thing wants her to be. She would snap the inhibiting bindings of her life to fall into the madness that whispers freedoms she will never experience any other way. The creature is offering her father temptations well beyond wealth and power. He is offering him things much more important. Can he resist? Could anyone resist such an offer? Pacts are mutually beneficial by nature, so what does the creature want as his part of the bargain? All hope may be lost, except for the one wild card that has appeared in this deck of cards...the red headed stranger. F. Paul Wilson has been on my radar for years. There are many mysteries surrounding the murky reasons why authors continue to be ignored by me in favor of others. I can only protest in my defense that I am beset by the siren songs of many books. I have scaled the first mountain in the Wilson oeuvre and plan to throw my grappling hook onto the next one very soon. There are six volumes in what is called The Adversary Series, of which this is the first entry. The second volume is called The Tomb, which introduces the cult favorite, character Repairman Jack. He is such a popular character that Wilson spun him off into fourteen other adventures. There is much to read, and from what I’ve researched, they are all worth exploring. This book is part of the 1980s horror fiction extravaganza that was so popular throughout the decade. Publishers were scrambling to find enough horror fiction to satisfy the thirsty public’s need for thrills and chills. True Crime books also took off in this same era. I remember ringing up armloads of paperback horror and true crime for readers who would query me for information about future publications in the hopes that their favorite writers were releasing something new...very soon. The quality of the writing of 1980s horror is uneven, to be expected anytime a surge in a genre occurs. (We are seeing this in YA right now.) However, there are some real gems among them. The Keep is certainly one of them. About ⅓ of the way into this book, I was completely caught up in the thrall of Wilson’s plotting. I devoted an afternoon to blowing through the last 200 pages. The characters are well developed, with flaws and redeeming qualities in equal measure. Well, not the SS, but then the more devoted members of that organization were twisted, mentally deformed individuals before they ever joined the party. 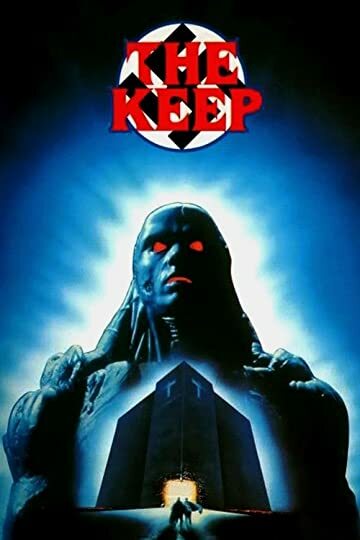 Michael Mann made a movie of The Keep back in 1983. I’m still unclear as to what exactly happened to that movie, but the original cut is three and a half hours long. The studio made the decision to edit the movie down to one and a half hours. This might account for why so many people find the movie indecipherable. I have not watched the movie, but having read the book, I should be better armed to follow even a hieroglyphic style version of the plot. Still one does wonder about the version Michael Mann intended. He was dead. And yet not dead. I’ve long been meaning to read The Keep. It is the first in the Adversary Cycle, and ties in with the (later) Repairman Jack novels. I have also seen it mentioned on numerous top-ten lists pertaining to Vampire Horror (although, to be fair, the author is very specific about the nature of his antagonist – but this is spoiler territory so I won’t go there). So, does it live up to expectation? Something in that air caused the hair on his arms and at the base of his neck He was dead. And yet not dead. Something in that air caused the hair on his arms and at the base of his neck to stand on end. If you have read any of the Repairman Jack novels, you will already know what to expect from this book, although admittedly The Keep leans more toward straightforward horror whereas the Jack books follow a genre mishmash template. That said, you will not often feel too upset when characters get killed, since they’re mostly portrayed as fairly villainous themselves. Something as dark and as cold as the chamber he had entered was awake and hungry and beside him. I found this to be a fairly visual read, that’s to say it would probably make for a good film what with all the fantastic set pieces, not to mention the World War II backdrop. There are scenes here that are genuinely eerie and / or scary. What’s more, at times the story is quite ingenious, especially the concepts of Light and Chaos that the author introduces. He was no longer in command of the keep. Something dark and awful had taken over. There is a love story here that feels forced and awkward. It certainly has a place in the story, but at times the author lathers it on a bit thick and the fluttery-eyed sugary-sweet gloop is hard to stomach. In my experience when it comes to this sort of thing less is more.The second gripe that I do have comes from a rather abstract place. The cover art of the new Tor editions are rather unimaginative and, frankly, boring. I much prefer the artwork of some of the older editions. She would fear the dark forever. In closing, there are some nice conspiracy theories thrown in for good measure. You know, just to thicken the broth. The Keep is a fairly solid entry in the Vampire Horror genre. Added bonus: it has some novelty value, especially if you already read Repairman Jack. And night had become a dread enemy. Beginning in Warsaw, 1941, this novel combines a Second World War story with Horror, creating a good mix of genres. Erich Kaempffer is a member of the SS and has just been promoted to become Commandant of Ploiesti – a new concentration camp in Romania, which is set to rival Auschwitz. Kaempffer is a dedicated man, who delights in murder and violence and also hopes to make himself a personal fortune. However, before he can set off to his new career, he is asked to visit a small army detachment, s Beginning in Warsaw, 1941, this novel combines a Second World War story with Horror, creating a good mix of genres. Erich Kaempffer is a member of the SS and has just been promoted to become Commandant of Ploiesti – a new concentration camp in Romania, which is set to rival Auschwitz. Kaempffer is a dedicated man, who delights in murder and violence and also hopes to make himself a personal fortune. However, before he can set off to his new career, he is asked to visit a small army detachment, stationed in the Alps, shortly north of Ploiesti. There have been frantic messages from their commanding officer, Captain Klaus Woermann, saying that they have suffered losses and asking permission to relocate. Kaempffer is asked to go and see what is wrong before being allowed to take up his new position. Of course, Woermann is known to Kaempffer, and their past history is one of conflict. As such, and with a much more lucrative post ahead of him, Kaempffer is keen to investigate, solve this issue quickly, and move on. The message from Woermann states, “Request immediate relocation. Something is murdering my men.” Imagining the problems to be partisans, Kaempffer sets out for the Keep. This turns out to be a perfectly placed tower, with endless crosses embedded into the walls. Two of Woermann’s men, thinking treasure is buried somewhere within the Keep, have accidentally released something of malevolent evil, and terrible power, which is now free to kill and to keep on killing. Just kidding...almost. There are Nazis in a Castle - or rather a Keep, in Romania, in the Transylvanian Alps, and there is something undead inside, and our story is set in 1941. It's a quick easy read. For all the meaty bits flying about there wasn't much meat to it and it didn't quite maintain the suspense I was hoping for - but it was still a bit of fun and enjoyable for what it was ie a traditional vampire(like) story. PSS - All German words appearing in this review are fictitious. Any resemblance to real German language, good or bad, is purely coincidental. Such a fun book. Vampires and Nazis — what could go wrong? An isolated keep full of ne'er do-wells from the Third Reich, but oh man do they get their comeuppance at the hands of a very old bro who is pissed as hell that someone be all up in his hizzouse. The only knock on this book is the dated damsel in distress plot line, the unbelievably beautiful woman who, for most of the book, is little more than a cowering, confused lass that can't come to grips with the reality in front of her. This ain' Such a fun book. Vampires and Nazis — what could go wrong? An isolated keep full of ne'er do-wells from the Third Reich, but oh man do they get their comeuppance at the hands of a very old bro who is pissed as hell that someone be all up in his hizzouse. The only knock on this book is the dated damsel in distress plot line, the unbelievably beautiful woman who, for most of the book, is little more than a cowering, confused lass that can't come to grips with the reality in front of her. This ain't no Dana Scully, gang. But, the book was published in 1981, so I think you have to give it some slack as a product of the times. Our heroine isn't completely helpless, that's for sure. 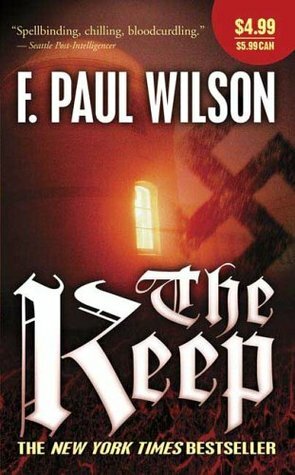 Ranked among the best horror novels of the twentieth century, and credited with shaping the landscape of that same genre through the 80s, it's hard not to be a little disappointed with what is on offer in The Keep. The set-up is quite good, with something unleashed from its hold in an abandoned keep stalking the German soldiers that have taken over said structure in the midst of WW2. For about a third of the novel, Wilson keeps the pace rattling along nicely, as the thing from the crypt murders Ranked among the best horror novels of the twentieth century, and credited with shaping the landscape of that same genre through the 80s, it's hard not to be a little disappointed with what is on offer in The Keep. The set-up is quite good, with something unleashed from its hold in an abandoned keep stalking the German soldiers that have taken over said structure in the midst of WW2. For about a third of the novel, Wilson keeps the pace rattling along nicely, as the thing from the crypt murders one soldier a night. The entity is equal parts menacing and mysterious, but clearly does not have good intentions at heart, creating quite the interesting quandary: Who does the reader root for? The Germans and the SS soldiers that join them? Or the entity that seems hell bent on destroying them? In fact, my favourite part of the novel was the conflict between the sympathetic German officer and the over-the-top evil SS major, even if this was relegated to the realm of the sub-plot by the halfway point of the novel. However, things begin to fall apart as other characters arrive at the keep, advancing the plot, but taking away from the evil versus a greater evil theme. By the end of the novel, nothing is as it seems, a trite romantic sub-plot has been woven in, and, worst of all, there is absolutely nothing frightening going on. In the end, it seems that whatever ability The Keep had to scare its readers has been lost within the mists of time. But Wilson is a skilled enough writer to maintain my interest in pursuing more of The Adversary Cycle, even if my expectations will be suitably tempered. I remember this book terrifying me when I read it in the early eighties. However, the horror is all reserved for the early chapters - towards the end, it becomes more of a thriller. This one is really old-fashioned. A centuries-old evil and its centuries-old nemesis fighting it out in a Transylvanian castle during the Nazi occupation. There is also a Jewish exorcist (well, folklorist, actually) and his beautiful daughter in the mix. If you love vintage ghost stories, this should be your cup of tea I remember this book terrifying me when I read it in the early eighties. However, the horror is all reserved for the early chapters - towards the end, it becomes more of a thriller. Read in the mid to late 80's when I was going through a King/Straub/Koontz/Herbert phase. This review has been hidden because it contains spoilers. To view it, click here. I've actually read this book before, but it still counts towards my 100 New Books goal because I didn't remember that I had read it until about a chapter or two in. The premise is great: Nazis move into a keep in Romania and start dying one-by-one at the hands of what can only be described as a vampire. Nazis, vampire, and even zombies near the end. Great stuff for someone like me. For the first 3/4 of the book, it's positively thrilling. It's creepy. It's atmospheric. But it falls apart near th I've actually read this book before, but it still counts towards my 100 New Books goal because I didn't remember that I had read it until about a chapter or two in. For the first 3/4 of the book, it's positively thrilling. It's creepy. It's atmospheric. But it falls apart near the end as the truth of what the mysterious hero Glenn really is, and his connection to the vampire in the keep. It becomes a story about ancient warring powers and demigods and nonsense with no leadup, suddenly shifting gears from horror to fantasy. Molasar, the vampire, is actually Rasalom the warlock from prehistory, and Glenn is actually Glaeken with a magic sword from that time too. It becomes too cartoonish. The villain was more threatening when he was an inhuman beast with no backstory other than the subtle hints of his relation to Dracula. Even the premise, promised on the back of the novel "Nazis vs a Vampire" falls apart as Glaeken takes the center stage and all of this ancient prehistory nonsense kicks in. The interesting characters, Kaempferr and Woermann are killed off and the center stage is left for the less interesting ones: the aforementioned Glenn, Magda (who inexplicably falls in love with Glenn on first sight, which is something the author enjoys reminding us of every third page), and her father. This is a sort of Lovecraftian historical fiction, if you will. Or even if you won't. Romania, 1941. The Nazis encounter an ancient entity almost as evil as themselves. Only a Jewish scholar and his daughter and a mysterious red-haired man can save them. I liked this older work better than Wilson's Repairman Jack novels, which tend to be overlong and feel repetitive after you've read a few of them. I was glad that I went into this book unaware of many of the plot elements. It made for a more exciting read. Despite this, I was still surprised as things turn out to be not as they seemed. I liked F. Paul Wilson's writing voice. It's erudite and sophisticated. He did his research about WW2 and what was going on in Europe at this time. The aspects of the Nazis' treatment of the Jews and the Gypsies made my heart hurt. I can't and never will understand such barbarity, cruelty, and inhumanity. Mr I was glad that I went into this book unaware of many of the plot elements. It made for a more exciting read. Despite this, I was still surprised as things turn out to be not as they seemed. I liked F. Paul Wilson's writing voice. It's erudite and sophisticated. He did his research about WW2 and what was going on in Europe at this time. The aspects of the Nazis' treatment of the Jews and the Gypsies made my heart hurt. I can't and never will understand such barbarity, cruelty, and inhumanity. Mr. Wilson doesn't just throw this in for a background historical context. This becomes a very important aspect of this story as it deals very much with the nature of evil, how humanity's actions perpetrate evil and its sickness in the world. The characters were engaging, making this supernatural story feel very grounded in some respects. I felt deeply for Magda. She was a strong woman hemmed in by circumstances, a sickly father who took her granted in a way that was almost criminal. All her dreams denied because of her need to take care of him, and because she was Jewish. Glenn is an interesting character as well. He's quite enigmatic, something more than human, although he wears the cloak of humanity well for the most part. He has lost touch with some of the human emotions, as he says, but in contrast to the SS soldiers, there is no question that he is a humane person. As for the Germans... I felt sorry for Woermann, and I didn't think he was a bad man. Imagine me feeling sympathy for a German soldier in WW2. The key point that I am glad that Wilson makes clear is that not all the Germans supported or believed in what Hitler was doing. Of course, many did act to thwart Hitler, and lost their lives in the process. Something that one might not choose to acknowledge on the surface, as it's easy to label all Germans as the hated Nazis. It is the truth, none the less. History now makes it clear that there was a strong German Resistance, as well there should have been. One hopes that good men and women will not stand by and watch evil happen, and Woermann felt like he had done too much of that and it destroyed his belief in himself, and the country that he had spent most of his life serving. In contrast, there was the SS commander, Kaempffer, who was a horribly evil, vile human being. It is harder to feel sympathy for him and his ilk, in light of his vicious and unwarranted hatred and persecution of people because they happened to be of a different ethnicity than him. Part of me relished seeing the SS soldiers get their just deserts, but Wilson makes it clear that this only perpetuates the dangerous taint of evil in this story. *A very obvious nod to the Lovecraftian mythos. They find copies of some of the forbidden books of Chthulu, such as De Vermis Mysteriis, Book of Eibon, Nameless Cults, Cultes des Goules and even The Necronomicon. Lovecraft fans will likely appreciate this as I did. *I liked the romance very much. It was good to see that Magda does get a chance to have a 'life' and to be appreciated in a way that she didn't in a man's world, with a father who doesn't respect her as much as he should, and as a member of a group of people who were horribly persecuted against. And Glenn has been alone so long. Now he isn't. *Some parts of this novel were truly creepy! I love a good scare, so I was a happy camper. It was less scary towards the end, but still thrilling and disturbing in a different way. *The history and setting made this WW2 history buff happy, although sad at the same time. The Shoah is a disturbing subject, even in fiction. The supernatural horror of this story pales in comparison to what kinds of horrors really happened, and the fact that behind them was human evil and institutionalized racism. *I like the cosmic scope of this battle between good and evil. I won't go into that, because that would spoil this book, and this is a book that the less you know, the better it reads. Suffice it to say, if you like arcane supernatural fiction as I do, you might enjoy these aspects of this book. I found myself reading this very quickly on my Kindle. I was immersed in this story, transported to 1940s Romania, and submerged in the gothic feel of this novel. Although I had no expectations, it turned to be a lot more than I even imagined. I enjoyed it a lot. Read and re-read, a really good vampire story set in WW2. There was a sourcebook out that gave more backstory to this tale, also worth reading but nearly impossible to find. This is part of a series of books which didn't appear connectd at first, but were brought together nicely in the end with a fantastic 5th book. Worth noting all 5 books stand alone nicely for those who don't like to read a series. While Repairman Jack was introduced in these stories, it was only in the last few, and these ar Read and re-read, a really good vampire story set in WW2. There was a sourcebook out that gave more backstory to this tale, also worth reading but nearly impossible to find. This is part of a series of books which didn't appear connectd at first, but were brought together nicely in the end with a fantastic 5th book. Worth noting all 5 books stand alone nicely for those who don't like to read a series. While Repairman Jack was introduced in these stories, it was only in the last few, and these are not a prequel. This is an original story series that first introduced the character. It was his popularity that spawned the spin-off RJ book series. Ma tõesti tahtsin, et see raamat mulle rohkem meeldiks. Idee on ju lollikindel – natside sõjaväeüksus asub postile Transilvaania mägikindluses ning nendega hakkavad juhtuma üleloomulikud ebameeldivused. Sellest lihtsast ideest saaks luua niivõrd vinge loo, ent autor piirdus kahjuks vaid keskpärasega. Stoori on nagu mõni Allo! Allo! stsenaarium: natsid kutsuvad end päästma mustlastega semmiva juudi soost professori ning tema kauni neitsiliku tütre. Süžee kulgeb muidu õuduslugude traditsioonilist r Ma tõesti tahtsin, et see raamat mulle rohkem meeldiks. Idee on ju lollikindel – natside sõjaväeüksus asub postile Transilvaania mägikindluses ning nendega hakkavad juhtuma üleloomulikud ebameeldivused. Sellest lihtsast ideest saaks luua niivõrd vinge loo, ent autor piirdus kahjuks vaid keskpärasega. Stoori on nagu mõni Allo! Allo! stsenaarium: natsid kutsuvad end päästma mustlastega semmiva juudi soost professori ning tema kauni neitsiliku tütre. Süžee kulgeb muidu õuduslugude traditsioonilist rada pidi; selles poleks iseenesest midagi negatiivset, kui vahepeal esineks ka mingeid twiste, mingeid põrutavaid üllatusi; kahjuks on neid minimaalselt ning enamikku toimuvast on võimalik juba mitu lehekülge varem ette ennustada. Tegelased on masendavalt ühedimensioonilised. Kõigil sakslastel peale ühe on eranditult negatiivsed iseloomujooned. Peategelaseks olev tütarlaps paneks iga feministi ahastama – kogu tema konflikt keerleb kahe mehe vahel valimise ümber. Peategelase isa on tüüpiline vana professor, kes tahab parimat, ent välja kukub nagu alati. Ja ühel hetkel välja ilmuv vampiirikütt oleks nagu kõigi seikluskangelaste paroodia – tuleb kohale, kepib tütarlast, tapab kurjami oma vägeva võlumõõgaga. Kolmandaks, Holokausti teemal jahumine, mis õigesti doseeritult oleks võinud loole anda surmtõsisuse mõõtme, muutub mingil hetkel tüütuks ja siis koomiliseks. Kõige Paham Nats on eriliselt totter kuju: suurema osa ajast veedab ta unistades, kuidas ta Rumeeniasse eriti vinge koonduslaagri ehitab ja kuidas ta seal siis juute ahju ajab. Üleüldse kõnelevad kõik Holokaustist nii endastmõistetavalt, nagu sellest iga päev lehes kirjutataks – seda ajal, mil ka natside endi seas kogu värgist vaid üksikud asjassepühendatud teadsid. Isegi professoriga semutsevat vampiiri ei säästeta, vaid ta peab iga öö viisakalt vana juudi kurtmisi kuulama – ilmselt selle jaoks, et teda poliitkorrektsusetuses ei süüdistataks. Ja lõpetuseks, mis pagana pärast oli vaja loosse sisse tuua lovecraftiaana keelatud raamatuid. Kindluses on olemas kogu kataloog ja nad ei mängi loos mitte mingit rolli. Tegelased korraks uurivad neid, viskavad need siis vastikusega käest ja enam neid ei mainita. Milleks kõik see? I read this book some years ago (I seem to say that a lot). I ran across it on the "Best Heroic Fantasy" list. I wouldn't really rate it "Heroic Fantasy"...anyway. Is the villain really the "proto-vampire"? Is the hero maybe as bad as the villain? These and other questions will be answered...but you need to get through it to the end. It's not a bad book but I've read a lot better. Th two main characters are linked together,immortal since what we are told is the first age of the world. One evil the I read this book some years ago (I seem to say that a lot). I ran across it on the "Best Heroic Fantasy" list. I wouldn't really rate it "Heroic Fantasy"...anyway. Th two main characters are linked together,immortal since what we are told is the first age of the world. One evil the other while supposedly with the "powers of light", has been his "imprisoner" for a long, long time. Till a human gets "conned and screws up the status quo. My attention was drawn back to this review and I couldn't resist the temptation to add a caveat. This is listed (see title above) as #1 in the Adversary Cycle. It's also called the Nightworld Cycle. This and were originally written as stand alone. They retroactively became part of a cycle drawn in, in . Mr. Wilson did an admirable job of mixing history, horror and romance in a gripping, chilling tale of a monster haunting a mysterious keep in the mountains of Romania during World War II. The cast of characters really made the story what it was. Underneath the German uniform, Captain Woermann was really not a bad man. He disagreed with the policies and actions of Hitler and the SS and tried to atone for his own failings. Major Kaempffer of the SS, on the other hand, was a truly sadistic and bruta Mr. Wilson did an admirable job of mixing history, horror and romance in a gripping, chilling tale of a monster haunting a mysterious keep in the mountains of Romania during World War II. The cast of characters really made the story what it was. Underneath the German uniform, Captain Woermann was really not a bad man. He disagreed with the policies and actions of Hitler and the SS and tried to atone for his own failings. Major Kaempffer of the SS, on the other hand, was a truly sadistic and brutal man, who might just have been as evil as the monster terrorizing the keep. Magda was a somewhat repressed, meek character at the beginning, but managed to find hidden reserves of strength and courage to fight for her father, her lover and her own sanity. Her father was not a bad man, either, but his sometimes callous treatment of her and manipulation of her intense loyalty to him lost him some respect in my eyes. I was happy when she stood up to him near the end. Molasar was a suitably evil, chilling villan, and Glenn, despite not being, in his own words, a totally "good" guy, was nevertheless a credible hero. The Keep is a high kind of "mini-castle" set in the mountains of Romania. The story takes place before America's entry into WWII. A detachment of German army soldiers is sent to the keep, which is situated so that anyone coming or going through a certain pass which leads to the invaluable Ploesti oil fields can be spotted. The first night there, there is a grisly and strange death. A few days later, an SS squad under the leadership of an overzealous commandant shows up to check out the trouble. He is on his way to Ploesti to start another concentration camp there. Once the SS commander realizes that the strange deaths of the Germans are not being caused by partisans in the countryside but rather by some nameless evil force, he sends for an expert in the area, a Jewish professor who is soon to be "resettled" with his daughter Magda. Fun, fast and easy to read. Lo que nos cuenta. En la Segunda Guerra Mundial, un destacamento de soldados alemanes destinados a un paso de montaña en los Cárpatos durante la primavera de 1941 está viendo morir de forma inquietante a sus hombres entre los muros de la antigua posición fortificada en la que se alojan. Tras la petición de ayuda del oficial al mando, se dirige al lugar un oficial de las SS con refuerzos, pero también irán allí un erudito hebreo que ha estudiado el lugar, su hija y un pelirrojo que desde Portugal parece sentir que algo no anda bien en esa pequeña población rumana. Novela también conocida como “El torreón” y primer libro del Ciclo del Adversario, pero que puede leerse de forma totalmente independiente. This book was a disappointment to me. I was hoping that the idea of a no of SS troops billeted in the aptly named "Keep" would be the recipe for a great story. However this never developed and the usual battle of good v evil occurred mixed in with a rather odd love story, resulting in a somewhat boring and pedestrian tale...not recommended! High in the Transylvanian mountains lies a keep that is being tended to everyday, nobody lives there and there is no known history concerning this fortress high on this pass. 1941 and a Nazi army detail enters this keep in order to make it a permanent fortress to safe keep nazi and Romanian interests. The strange keep with its thousands of crosses generates greed and in damaging the keep the German soldiers release and ancient evil. One that takes lives and drinks blood. A message for help sends High in the Transylvanian mountains lies a keep that is being tended to everyday, nobody lives there and there is no known history concerning this fortress high on this pass. 1941 and a Nazi army detail enters this keep in order to make it a permanent fortress to safe keep nazi and Romanian interests. The strange keep with its thousands of crosses generates greed and in damaging the keep the German soldiers release and ancient evil. One that takes lives and drinks blood. A message for help sends a SS-major and his troops into the keep in the conviction he will solve this matter quickly and then start his real job by building a concentration camp in Romania. However the Nazi evil is small potatoes compared to this ancient version. An professor of History sits at home ill and out of work, he and his daughter who cares for him are dragged into the mountains because of their knowledge about the keep and the local history. They are Jewish and expendable. Whose side will they chose when they come face to face with the evil. Who is this deadheaded mand who when he felt that the keep was violated came all the way back from Portugal to face the evil that has been released? When all the stories converge we will see a fight against evil as we always recognized but have forgotten as well. Stories of normal, evil and neutral people placed into a situation that is manipulated by mere mortal man and ancient powers. This is the first book in "the adversary cycle" series of novels. It doesn't end on any kind of cliffhanger, though, so it can definitely be read on its own. There are basically 2 forces in the universe: Chaos and light. Both forces have their own agents. In "The Keep", we meet 2 of them. It's 1941 in Europe. The Germans have invaded Poland and are extending into Romania. A German regular army company has been ordered to occupy a keep in a mountain pass in Romania because it has a good vie This is the first book in "the adversary cycle" series of novels. It doesn't end on any kind of cliffhanger, though, so it can definitely be read on its own. It's 1941 in Europe. The Germans have invaded Poland and are extending into Romania. A German regular army company has been ordered to occupy a keep in a mountain pass in Romania because it has a good view of any coming and going foot traffic. The commander of the company is being punished for not joining the Nazi party, but he's a WW I war hero so they can't just throw him out. After occupying the titular Keep, soldiers begin to die during the night, their throats ripped out, at a rate of 1 per night. The commander, knowing that it's not a normal enemy, requests that his company be moved elsewhere. The local German headquarters responds by sending out a contingent of SS men, led by a despicable Nazi death camp commander whose next assignment, after the investigation, is to start up a new death camp in Romania. He thinks it's Romanian partisans killing off the German soldiers. He's wrong! The plot continues from there. The thing killing people in the keep is quickly surmised to be a vampire. The SS commander and the regular army commander lock horns more than once. They know each other from before, and they hate one another. Other people are brought in to help with the investigation, including a Romanian History professor, who also happens to be a Jew. I liked the antagonists in this story. The main one is not actually a vampire; it's the creature upon whom the vampire legend is based. This makes for an interesting contrast between what we as readers know about vampires and the reality of the creature depicted in "The Keep". It's much, much worse than a vampire. A conventional vampire is a cute bunny rabbit compared to what's in "The Keep". The other antagonists are the Germans; specifically the commanders. One commander, the regular army one, is definitely more of a sympathetic character than the other, the Nazi SS commander. However, they are both well characterized as just guys with strongly-held beliefs trying to figure out what's happening to them. Is it scary? There are parts of it, mostly when depicting the main adversary, that are genuinely chilling. I think F. Paul Wilson did a good job of setting up a sense of horror and dread leading to the climax of the book. Maybe it's the fact that bad guys are more fun, but the protagonists, while well done, were not as compelling as the antagonists. They were certainly not morally "pure", so they were realistically written. However, they just weren't as interesting. I would have preferred a little more plot involving the main adversary in "The Keep" and a little less plot involving the clash between the German commanders. These are really just nitpicks, though. If I could give it 4 1/2 stars, I would. I say that vampire fans should get it to read the author's take on the vampire legend. I really enjoyed it and found it fresh. It's a page-turner. I couldn't put it down most times when I would get into it. I can't think of a higher praise for this kind of book. It's definitely a have-to read if you're a vampire fan looking for something fresh. The book started off strong for the first quarter to third but once the Nazi reinforcements arrived, it began to slow down and got heavy pretty quick. Specifically, the author could have thinned some of the discussion and details of the subplot between the officer and the Major but the story remained engaging enough to keep reading. The last 75 - 100 pages made it all worthwhile, though! Without giving any spoilers, I'll just say this was a new and welcomed twist to an old story. 4 solid stars o The book started off strong for the first quarter to third but once the Nazi reinforcements arrived, it began to slow down and got heavy pretty quick. To date, the best Wilson I've read. Pretty creepy story where the bad guys (the Nazis) meet a really bad guy -- or thing, in a castle located in the Balkans. The setting is damn near perfect. I think the story suffered a bit at the end when Wilson shifted gears to throw a bit of a curve ball at the readers expectations. I don't think that was needed, but overall a minor complaint. This was my first foray into Wilson's "Secret History of the World" and it fueled my interest in reading more! The book flows easily and keeps the reader guessing until the very end. Highly Recommended! Read it several times over the year, absolute classic. Francis Paul Wilson is an author, born in Jersey City, New Jersey. He writes novels and short stories primarily in the science fiction and horror genres. His debut novel was Healer (1976). Wilson is also a part-time practicing family physician. He made his first sales in 1970 to Analog and continued to write science fiction throughout the seventies. In 1981 he ventured into the horror genre with t Francis Paul Wilson is an author, born in Jersey City, New Jersey. He writes novels and short stories primarily in the science fiction and horror genres. His debut novel was Healer (1976). Wilson is also a part-time practicing family physician. He made his first sales in 1970 to Analog and continued to write science fiction throughout the seventies. In 1981 he ventured into the horror genre with the international bestseller, The Keep, and helped define the field throughout the rest of the decade. In the 1990s he became a true genre hopper, moving from science fiction to horror to medical thrillers and branching into interactive scripting for Disney Interactive and other multimedia companies. He, along with Matthew J. Costello, created and scripted FTL Newsfeed which ran daily on the Sci-Fi Channel from 1992-1996.